Bintou Barro, who is expecting her first child, meets with midwife Bela Marcelline (on right) for her antenatal care appointment at an urban health center in Burkina Faso. Photo by Charles Wanga. Bintou Barro, a married student at the University of Ouagadougou, has come for antenatal care at the Urban Primary Health Care Center of Dassasgho in Burkina Faso’s capital. The center is busy, with children running and playing in the halls, pregnant women waiting for their antenatal care visits and others receiving their test results. Barro is 9 months pregnant with her first child and, to protect herself and her baby from malaria, she has come to just the right place—the facility has skilled health care providers trained on malaria prevention and treatment. “As a student, I’m aware about malaria and treatment,” Barro said. “During the center’s education sessions, we learn about a lot of things.” These sessions, guided by staff or trained community health workers, cover topics that range from malaria prevention to nutrition during pregnancy, to preparing for childbirth, to postpartum family planning. Barro, whose husband lives and works outside of the capital, has dutifully attended antenatal care sessions throughout her pregnancy to ensure that she has access to malaria prevention medicines. The 25-year-old biochemistry student has found an ally in midwife Bela Marcelline. 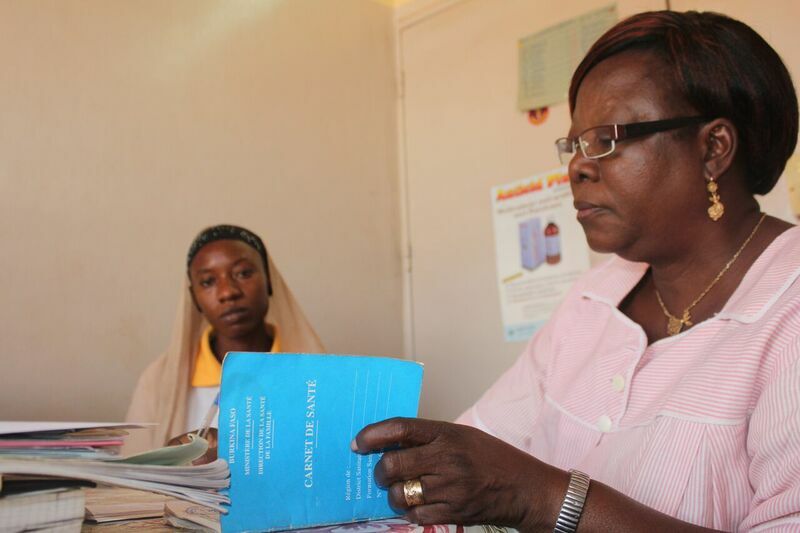 Marcelline has a strong commitment to educating her clients on prevention services because she has seen the impact of malaria on women. Marcelline’s center is part of the Jhpiego-led Improving Malaria Care (IMC) project, funded by the United States Agency for International Development. This initiative provides technical assistance for the prevention, diagnosis and case management of malaria, with specific emphasis on malaria in pregnancy and in children under age 5. Through this project, Jhpiego is supporting the National Malaria Strategic Plan and increasing the National Malaria Control Program’s capacity to plan, design, manage and coordinate a comprehensive malaria control program. The goal of the IMC project is to reduce malaria-related deaths by 50 percent over 5 years in Burkina Faso and protect the next generation against this life-threatening and debilitating disease. In 2015, there were 8,286,463 cases of malaria reported in the country, with 5,379 deaths; among these deaths, 4,005 were children under age 5 and 42 were pregnant women. Under the IMC project, 1,819 providers from 53 health districts were trained on updated national guidelines on prevention and treatment of malaria. Providers at 136 facilities received post-training supervision and had their skills honed in the use of rapid diagnostic tests to confirm malaria prior to treatment with artemisinin-based combination therapy, and in the revised guidance for intermittent preventive treatment of malaria in pregnant women. Jhpiego helped update the national guidelines and training manuals and strengthened the national monitoring and evaluation plan for malaria to align it with the revised malaria strategy and training package. The project is making great strides in reaching and protecting pregnant women like Barro from malaria through lifesaving prevention information and treatment. Thanks to her vigilant visits to the health center and ensuring that she has obtained the necessary treatment, Barro is confident that she has protected her baby from malaria.